If you have damaged or lost any components, or just fancy making your Superbike Stand look like new this is the kit you will require. 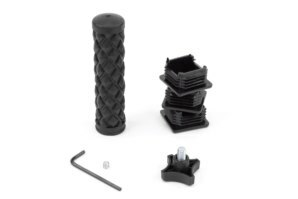 This kit includes: x1 handle grip, x3 square inserts, x1 thumb screw, x1 grub screw & 3mm hex key. Make you Superbike Stand look fresh by replacing old tatty components. Simple & easy to install in seconds. How do I fit the rubber handle grip to the abba superbike stand? The best way to fit the grip over the tube on the superbike stand is by spraying hair spray (yes hair spray!) inside the grip and over the tube itself. This will allow the grip to slide on very easily, once dry the stickiness of the hair spray acts like glue and the grip will be held firmly in place. If you do not have hair spray you can use hot water and washing up liquid which does a similar job. Got a Question about the abba Component kit? If you would like to ask us a question about the abba Component kit, simply fill in the form below and we will contact you within two working days. Want to tell a friend about the abba Component kit? Alternatively fill in the form below and we will send an email on your behalf to your friend, with a link to this page all about the abba Component kit.